Click on the vignette corresponding to your choice, then replace one or several photos offered by default by that of your choice: photographs of family, of holiday, of the site or photos found on the Web. Calendar annual decorative with cats. 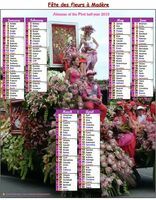 annual calendar of style 'Schedule of posts' with photo in the center. Calendar annual style schedule of posts. Calendar annual with family photo. 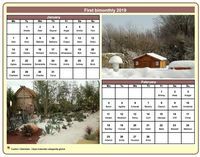 Calendar monthly to print with two photos of holiday. 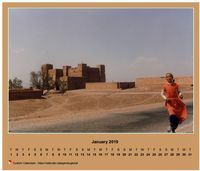 Calendar monthly to print, horizontal with photo. 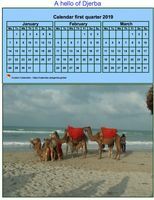 Template by default (9) of the calendar monthly, table with photo. Calendar to be printed monthly with photograph below. Calendar monthly with a different photo every month. 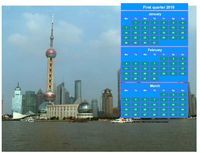 Calendar bimonthly in column with photo in the centre. You will be able to customise the layout of the calendar (dimensions, colors, alignment, police) via tabs 'Calendar', 'Month' and 'Boxes' (2). A photograph is put underneath the calendar bimonthly (5) and a legend is diplayed on the top (6). You will be able to customise the layout of the calendar (size and colors of boxes, alignment, police) via tabs 'Calendar', 'Month' and 'Boxes' (2). A photograph is put to the right of the calendar bimonthly (5) and a legend is diplayed on the top (6). You will be able to customise the layout of the calendar (dimensions, colors, alignment, police, borders) via tabs 'Calendar', 'Month' and 'Boxes' (2). A photograph is put to the left of the calendar bimonthly (5) and it is possible to add a legend (6). Calendar bimonthly with a different photo every month. Calendar quarterly in column with photo in the centre. To customise the layout of the calendar (dimensions, colors, alignment, police), use tabs 'Calendar', 'Month' and 'Boxes' (2). Calendar quarterly with a different photo every month. 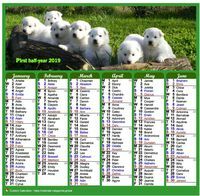 Calendar half-year in column with a different photo every month. Calendar half-year with a different photo every month. To change the background color of the photo calendar, click on the 'Calendar' tab. To display or not display the names of saints in the photo calendar, click on the 'Data' tab. You can even display two, three, or four saints a day. 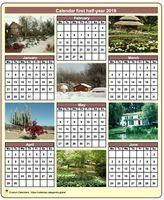 Each sample photo calendar proposed above is built from a template. All calendar templates are customizable.